In this post I’ll explain what we did on Week 4 of Decentralised Teaching and Learning and introduce Quizlet as a learning tool. You’ll also get free Skype vocabulary cards and a Skype roleplay exercise! At the start of this project I thought ‘how the hell am I going to fill a 2-hour class with no coursebook?’. But it’s actually not as hard as you think – with the imposed structure of a coursebook gone, you have to create the syllabus and lesson content with the learners, which takes time, negotiation and skill – but you learn and develop the skills as you go! As the Machado poem says, ‘We make the path by walking‘. All of which I agree with, especially establishing a climate of trust. With adult learners I think there is also a sense of ownership and responsibility. So at the start of this week’s class, we had a discussion about what we would talk about in next week’s lesson, as on the syllabus the learners had proposed a debate/ discussion. We brainstormed topics including the NSA scandal, e-commerce, business expansion but the topic that got the popular vote was ‘Refugees’. So, over the next week we will research, share information and prepare for the debate. What an interesting topic! 1) We brainstormed situations in which they need to use Skype. Among the answers were starting the call, (e.g. “Can you hear me ok?”) giving updates, discussing problems and suggesting solutions. It’s also important I think here to point out why Skype communication is different from a ‘regular’ telephone call. In a telephone call you can usually hear each other from the start whereas with Skype, this has to be negotiated because of different settings people might have, and arriving at a reasonable level of sound quality and being audible cannot be taken for granted. 2) I produced a list of Skype useful phrases which you can download here. Then I cut them up into single phrases- 1 set on blue paper, 1 set on green – so I can tell them apart easily and reuse them. The teacher keeps the category headings, and the learners then have to discuss how to group the phrases. 3) When the learners had finished this – there were a lot of phrases so it took 15/ 20 minutes – I checked they had the right phrases in the right groups and answered any questions they had. i) Decide on topics and sub-topics for the other team. ii) Exchange roleplay worksheet with the topics written on – you then have 5 minutes to prepare what you are going to say using the vocabulary from Step 2.
iii) Make the call. In my class I had two separate teams who went into two different rooms to make the Skype call. In reality, due to a number of different technical problems (weak wi-fi connection) we could actually hear the other team through the walls better than through Skype! So in the end the other team Skyped (yes – it’s a verb!) my mobile, which worked a little better. We also used the text chat function to try and get round the problem. 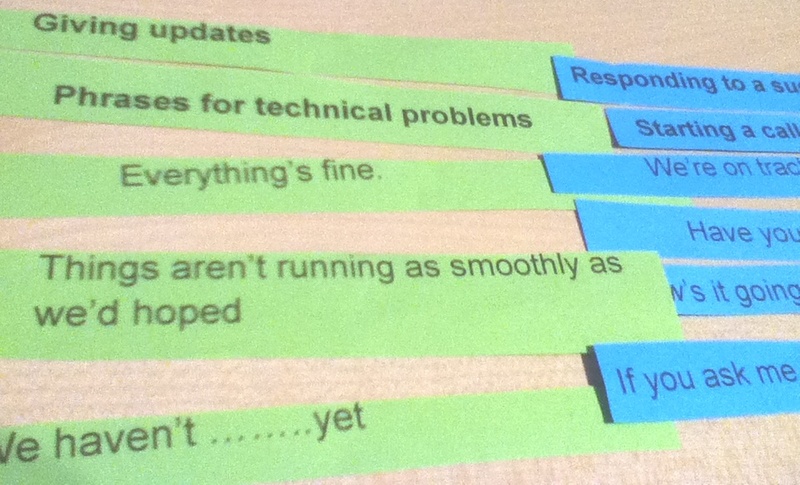 If nothing else, this was great practice in using Phrases for technical problems! If I had to do this again, I would run a quick pilot using the wi-fi in the building before the lesson. Or I would get one team of learners to go to another part of the building and use a LAN connection – wi-fi is often not strong enough a signal to Skype effectively. But never mind, the learners enjoyed the lesson and went away with some useful phrases. After the lesson I put a few of the phrases on quizlet and one of the learners finished the quizlet set for me (thanks Tamara!) which you can access here. I’ve used Quizlet before when cramming for my Diploma exam but there are so many more features now – I really recommend it. You can set up a class with your learners, share sets of cards and even start discussion on sets. Plus you can add images, sounds to the flashcards. This also extends learning outside the classroom (thanks to Christian Reuter – @christiareuter – for updating me on quizlet!). Do you think it’s important to teach business english (or other) learners how to use Skype more effectively? This entry was posted on November 25, 2013 by paulwalsh in DCT in action, For Teachers and tagged Action, adult learners, Decentralised Teaching, Decentralized Teaching, design, Learner, negotiated syllabus, quizlet, skype, Skype phone, useful phrases.